Welcome to DH MicroSystems, Inc.
& Custom Injection Molded ABS Products. The breadboard model which we use on our BB18 development board is available again and we are now taking orders for BB18's. Visit our BB18 product page for information or to place your order. Need a Bezel for 4x20 LCD? Since we introduced this product we have been supprised by the number of inquiries we have received. We originally produced these for our use on our own projects now we supply them for both hobby and OEM use. Check it out on our ABS Products page then contact our Sales Dept. at: sales@dhmicro.com for volume pricing and delivery options or our Engineering Dept. at: engineering@dhmicro.com to discuss your project requirements. Why Use Our PIC Prototyping Products? 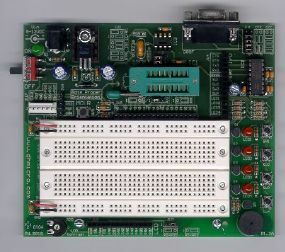 We have designed all of our PIC prototyping and development boards with features suitable for use by the professional engineer, but we have priced these boards for everyone. Our products are high quality, well documented, and flexibly designed for nearly any application. These boards can be powered from your bench supply, or via a battery or a common wall adapter for classroom portability. Engineer? You can start your designs out on our BB18 development board where you can rapidly try out many designs on its solderless breadboard. When you are satisfied with your design, you can migrate it to one of our RapidNNi or RapidNNiXL prototyping boards for a more permanent prototype. Educator? Consider our BB18 development board as an ideal platform for teaching students about microcontrollers (besides that, we will even give you a 10% discount for your educational purchase). Your time is valuable; with prices like we offer why point-to-point wire your next PIC-based project? When Performing an hp3000 migration, don't forget to store your microcontrollers in a dry and cool place. Copyright © 2003, 2004, 2005, 2006, 2007, 2008, 2009, 2010 DH MicroSystems, Inc.
Email webmaster@dhmicro.com for questions or comments regarding this website. 220,021 visitors since last major update.